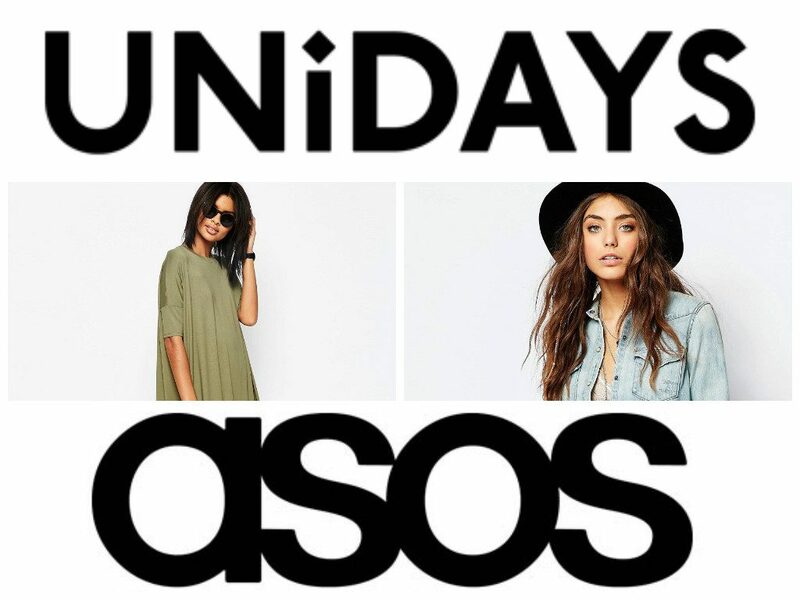 An ad popped up on my Facebook page today for UNiDAYS who are offering students a 20% discount on ASOS before 5pm on the 29th April, just in time for the bank holiday! I had a browse of the site and chose my top picks from their current offerings to share with you. First is this Keepsake Reality strapless dress with a split level skirt. I love the coral colour which is gorgeous for the summer and suits a multitude of colourings. If you had a wedding, communion or race day coming up, this would be perfect and could be accessorised with so many different colours which makes it extremely versatile! It’s €156 with your 20% discount. I have such an obsession with bomber jackets at the moment! They go with absolutely everything; team them with jeans and pumps for an easy-to-wear everyday look or over a jersey dress and trainers for an edgier look when the sun comes out ☀️ This Adidas Originals bomber features sheer sleeves and a cool contemporary graphic print. This jacket is €74 but apply the discount code and it’s yours for €60. This embellished mesh split-front cami is the bees knees, I think it’s gorgeous! If I was shopping for holidays, this would be top of my list. As we all know by now, anything embellished is an immediate hit with me but I love that this is a long line top and could be popped over a spaghetti strap dress or a high waisted skirt. Imagine how fabulous this would look sparkling in the sun?! This is a piece from ASOS’s own brand and is €68 but with the 20% off it’s just €55. The belt featured with it has also been something I’ve been on the look out for. This ASOS one is €23 but with the UNiDAYS discount it’s just €19 and I don’t think you could pass that up! 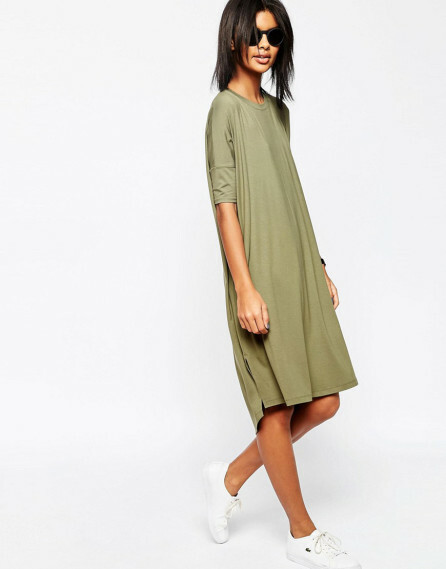 Finally, this khaki green oversized t-shirt dress is a handy staple piece to have for the summer. I love the colour – khaki has been a huge hit this year and it’s very military inspired. 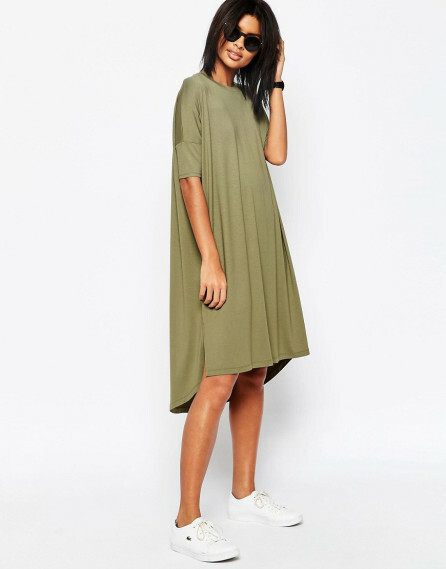 Not everyone is going to love the oversized fit of this dress but I think it’s so cool, especially how its styled here with just sunglasses and trainers, simple but effective – sometimes less is more. Add a waisted belt here to emphasise your figure and sport a more fitted look. There’s honestly so much you could do with this dress and at just €25 with the discount, how could you go wrong?! Great picks! My favorite is the Adidas Originals bomber — soooo cute! It’s fab, I’ll be dreaming about it tonight haha!